Home • More Magic • Mrs Claus's Top 7 Christmas Recipes for the Summertime! Christmas themed recipes which are perfect for those hot sunny days! Did you know that because Australia is in the Southern Hemisphere, it is summer when they celebrate Christmas - people even enjoy a BBQ on the beach on the 25th December! Many of the more well known Christmas recipes such as Mince Pies, Christmas Pudding and Roast Turkey aren't quite as suitable in the hot weather, so Australia and many of the other Southern Hemisphere countries have some great ideas to still celebrate the festive time when the sun is out! Here is my top selection of these great recipes - why not try them this summer for a great reminder of Christmas in the Sun! Many of the recipes require using knives and ovens, so best to get an adult to help you. They get a little more complicated as you work your way down, so in no time you will be challenging me to cook the best meals for Santa! This idea is so simple that it doesn't even really need a recipe! 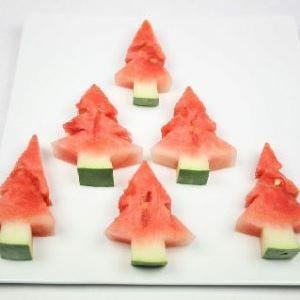 Simply chop a watermelon into slices, before then cutting into Christmas Tree shapes. The best part is you can eat the spare pieces of watermelon as you go! Thank you to Brisbane Kids for this idea. Another simple idea with only a couple of steps...! 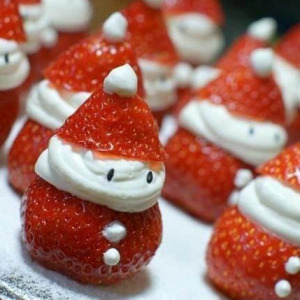 Cut strawberries around 2/3 of the way up so that their top will make Santa's hat. Then fill in between the 2 sections with whipped cream, as well as adding 2 dots on the front for buttons, and one on the top for the bobble on the hat. For the finishing touch, use 2 poppy seeds (or similar dark edible seed) for each Santa as the eyes. Thank you to Laurence Dallaire for this idea. Santa's favourite summer drink, Frozen Hot Chocolate is a great opportunity to have an indulgent chocolatey treat on a hot sunny day. Click here to see how to make it. 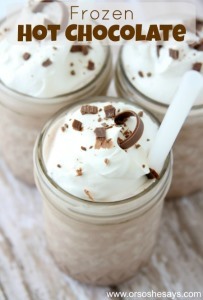 With ingredients including ice cream, chocolate and whipped cream, you'll want to make it again and again! 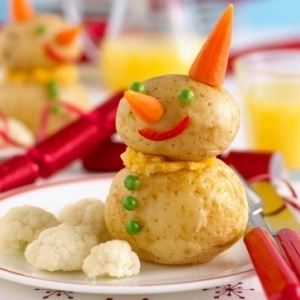 Image from "Or so she says..."
Great for a fun and easy Christmas themed dinner, this baked potato snowman can be made (and enjoyed) at any time of year! 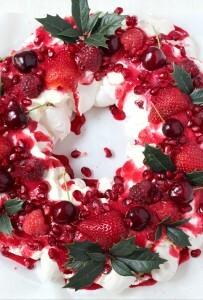 It may look like a stunning wreath to put on your door, but it might end up a little bit messy if you tried to hang this pavlova! A fantastic centre showpiece after a BBQ or summer lunch, this pudding makes great use of the seasonal berries available when the weather is warmer. Click here to see the full recipe on "My Square Frying Pan". 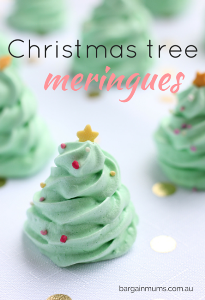 Image from "My Square Frying Pan"
If you have any problems with the meringue mixture for the above Pavlova, why not have a practice and try some Christmas Tree Meringues! With just 2 ingredients for the meringue itself, they couldn't be simpler to make! See the full recipe and get working on your piping skills here! 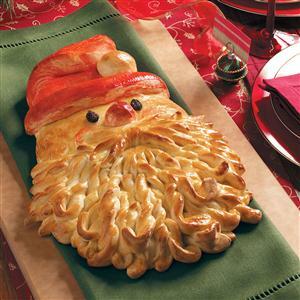 Definitely the trickiest one last, but this Santa loaf does look incredible - just like the big man himself! I hope you have fun trying all of the recipes and can enjoy the Christmas spirit all year round!